The Amen Clinics Method gives our physicians a deep understanding to target treatment specifically tailored to your brain and situation. Today, psychiatry is practiced by many physicians the same way it was years ago: A doctor assesses your symptoms, forms a diagnosis based on those reported symptoms, and then prescribes a medication at a dosage that may or may not work. From there, it’s a matter of watching to see if he or she got it right. Many times, patients will get multiple diagnoses and prescriptions before they find relief – if at all. Treatment success rates have not improved in decades, even though technology and science have progressed dramatically. 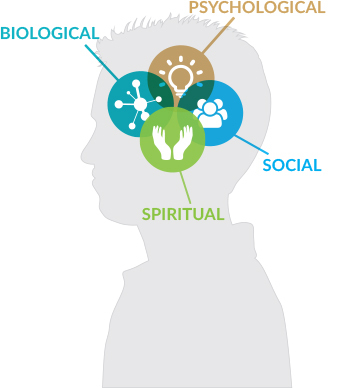 At Amen Clinics, we see the condition of every patient as a result of 4 primary factors, all of which can have a meaningful impact on mental health: your biology, psychology, social life, and spiritual life. We have designed our intake process to look at each of these factors. This allows us to truly understand you. We want to know about your genetics, overall health, diet, exercise, and any history of brain injury or exposure to toxins. We’ll explore your thinking patterns and ask if you had any significant developmental events or emotional traumas in the past. We’ll ask what your relationships with friends and family are like, if you have a lot of stressors and if you spend time with others or feel isolated. We want to know why you care, what’s important to you and what gives you a sense of meaning and purpose in life. Imaging and neuropsychological tests tell us how your unique brain functions. If deemed appropriate, specific blood tests can tell us more about the quality of your health. Areas of the brain that work well. Areas of the brain that don’t work hard enough. Areas of the brain that work too hard. 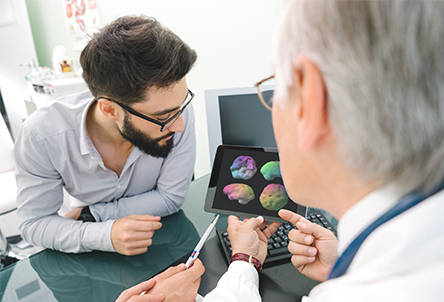 SPECT images provide extremely valuable insight: They connect the dots between your brain function, behaviors and symptoms, which helps our doctors create an individualized treatment plan that is effectively targeted to meet your needs. 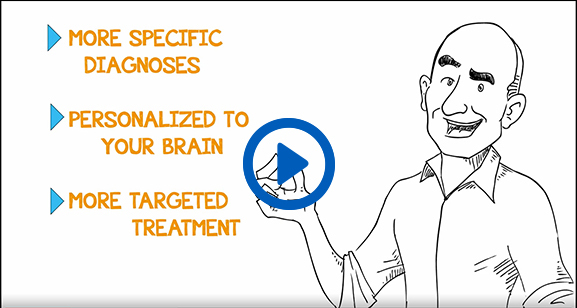 We use 2 neuropsychological tests (Conner’s Continuous Performance Test-II and WebNeuro) to give us additional details about how your brain is working. The Conner’s Continuous Performance Test-II helps to assess focus, response speed and impulse control. WebNeuro measures domains of function in thinking, feeling, emotion, and self-regulation; including tests for mood, anxiety, attention, and memory. Your biological state plays a powerful role in your mental health. For instance, if your hormones are out of balance, your mood and mental clarity will be out of balance too—and no amount of antidepressants or stimulants are going to help. If deemed appropriate, we will order a set of diagnostic lab tests to measure your basic health numbers, and depending on the circumstances, we may also order genetic markers or more extensive testing. At Amen Clinics, we understand that no two people are alike, and treatment is not one-size-fits-all, especially in psychiatry. Our doctors will provide you with a personalized, targeted treatment plan geared toward your symptoms and your brain. Find out if The Amen Clinics Method is right for you. Call us today at 888-288-9834 or schedule an appointment.